Fully Integrated Workspace – All the tools are easily accessible on screen. The application fully supports mouse drag & drop allowing intuitive operations. Built-in Librarian – A powerful Librarian was included in the interface to let you manage your icon collections with ease. Always visible on screen, it fully supports drag & drop operations and more. Powerful File Explorer – A built-in file explorer permits browsing your disks and find files including images and all files containing icons. Batch Operations – Sometimes you have a large number of icons to process. 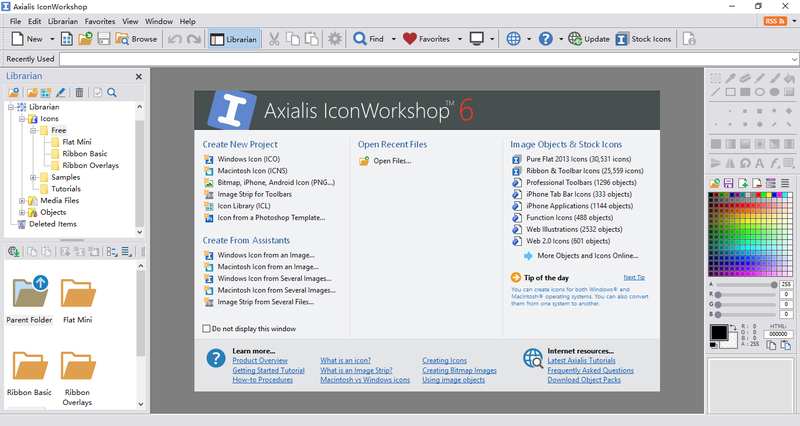 IconWorkshop includes several batch processing features to create icons from images, convert image formats, normalize image sizes and more. Image Objects – This exclusive feature permits creating professional-looking icons in minutes using a few mouse drag & drops. A large quantity of basic image objects are provided in a library. By associating them together you create your own custom icons. That’s easy, fun and powerful! If you work with Adobe products, you’ll enjoy IconWorkshop plug-ins for Illustrator® and Photoshop®. Once installed, the plug-ins will let you transfer images directly from your Adobe application to IconWorkshop without saving a temporary file. Support for Windows 10 icons: Create icons for Windows 10. Two new formats added: 768x768and 512×512.